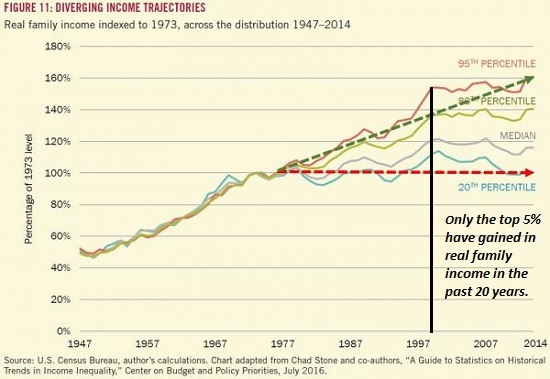 Do the Roots of Rising Inequality Go All the Way Back to the 1980s? Unless we change the fundamental structure of the economy so that actually producing goods and services and hiring people is more profitable than playing financial games with phantom assets, the end-game of financialization is financial collapse. I presented this chart of rising wealth inequality a number of times over the past year. 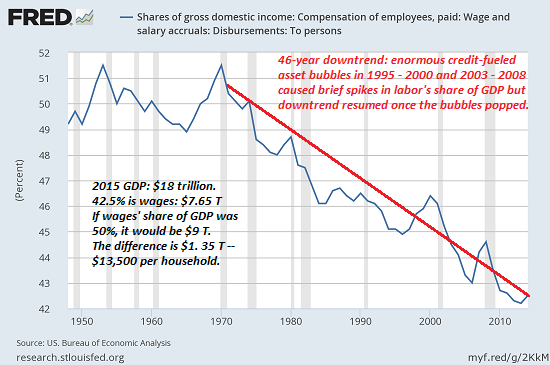 Do you notice something peculiar about the inflection points in the 1980s? Correspondent W.S. 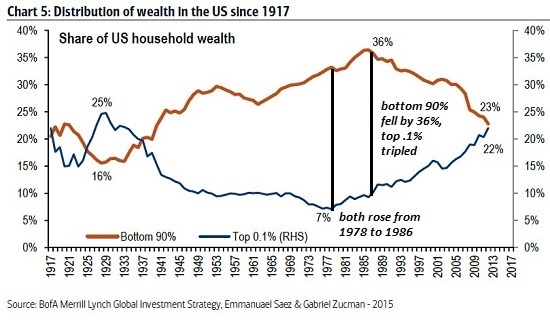 noted that the inflection point for the top .1% (late 1970s) preceded the inflection point of the bottom 90% (around 1986): both increased their share of household wealth from 1978 to 1986, and then the share of the top .1% took off, essentially tripling from 8% to over 22%, while the share of the bottom fell precipitously from 36% to 23%. So what happened between 1978 and 1986? 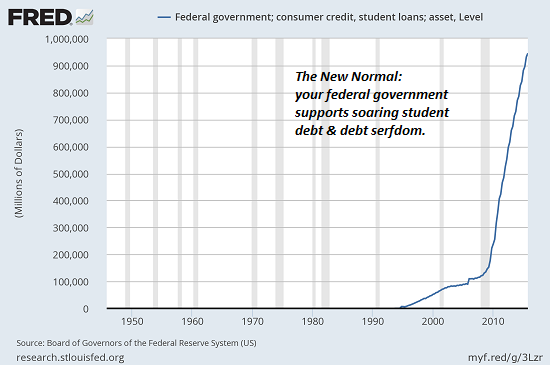 The first phase of the financialization of the U.S. economy. What is financialization? In a financialized economy, speculating with highly leveraged debt and exotic financial instruments is far more profitable than producing goods and services. Financialization hollows out the productive assets of an economy by incentivizing leverage, debt, opacity, speculation, financial fraud, collusion and the perfection of crony capitalism, i.e. financial Elites' ownership of the government's regulatory and legislative bodies. Here is another less pungent description via Wikipedia: "Financial leverage overrides capital (equity) and financial markets dominate traditional industrial economy and agricultural economics." In the US "total credit market debt divided by GDP was about 1.5 from 1961 to 1981. It accelerated rapidly in the decade of the 1980s - from 1.6 in 1981 to 2.3 in 1989 - as the federal budget deficit soared, hostile takeovers and leveraged buyouts loaded corporations with debt, and household borrowing increased. Corporate and household borrowing raised indebtedness further in the 1990s; by 2001 the debt to GDP ratio was 2.8, almost double the ratio in the Golden Age. Moreover, average real interest rates have been much higher in the neoliberal era than they were in the three decades that preceeded it. While “bloated” conglomerates were linked by some to the sluggish performance of the American economy in the 1970s, for corporate raiders they presented a get rich quick opportunity via the “market for corporate control” (Manne 1965). Outsiders could buy the firm from its existing shareholders, fire its managers, and sell off the parts for a quick profit. After the election of Ronald Reagan in 1980, this became possible on a grand scale due to relaxed antitrust guidelines, changes in state antitakeover laws, and financial innovations that enabled raiders to get relatively short-term financing on a large scale (Davis & Stout 1992). Within a decade, nearly one-third of the Fortune 500 largest industrial firms had been acquired or merged, often resulting in spinoffs of unrelated parts, and by 1990 American corporations were far less diversified than they had been a decade before (Davis et al 1994). The other thing that happened in the mid-1980s was computer technology became cheap enough and powerful enough to start replacing human labor on a wider scale. Spreadsheets such as Excel became accessible to small business, and the desktop publishing combo of the Apple Macintosh and laserprinters revolutionized the cost structure of marketing. The rise of the Internet (coupled with cheap memory and processing power) further fueled the productive expansion of digital technologies. As I describe in my book Get a Job, Build a Real Career and Defy a Bewildering Economy, these tools-- which are now ubiquitous and inexpensive--enable one person today to equal the output of what once took four people to produce in the late 1980s. In effect, labor entered an era of dynamic over-supply just as healthcare costs began to rise, making it more costly to hire workers. Some skills and trades remain scarce and thus well-paid, but as a generalization it became cheaper and more efficient to replace increasingly expensive human labor with increasingly inexpensive and powerful software and digital tools. Unless we change the fundamental structure of the economy so that actually producing goods and services and maximizing opportunities for people is more profitable than playing financial games with phantom assets, the end-game of financialization is financial collapse. Thank you, Gary R. ($50), for your splendidly generous contribution to this site -- I am greatly honored by your steadfast support and readership. Thank you, Larry D. ($25), for your supremely generous contribution to this site -- I am greatly honored by your support and readership. Central bank policies have generated a truly unprecedented "trickle-up" of wealth and income to the top .5%. Over the past 20 years, central banks have run a gigantic real-world experiment called "trickle-down." The basic idea is Keynesian (i.e. the mystical and comically wrong-headed cargo-cult that has entranced the economics profession for decades): monetary stimulus (lowering interest rates to zero, juicing liquidity, quantitative easing, buying bonds and other assets-- otherwise known as free money for financiers) will "trickle down" from banks, financiers and corporations who are getting the nearly free money in whatever quantities they desire to wage earners and the bottom 90% of households. The results of the experiment are now conclusive: "trickle-down" has failed, miserably, totally, completely. It turns out (duh!) that corporations didn't use the central bank's free money for financiers to increase wages; they used it to fund stock buy-backs that enriched corporate managers and major shareholders. The central bank's primary assumption was that inflating asset bubbles in stocks, bonds and housing would "lift all boats"--but this assumption was faulty. It turns out most of the financial wealth of the nation is held by the top 5%. As for housing--yes, a relative few (those who happened to own modest bungalows in San Francisco, Seattle, Portland, Toronto, Vancouver, Brooklyn, etc.) on the left and right coasts have registered spectacular gains in home appreciation as the housing bubbles in these cities now dwarf the 2006-07 real estate bubble. But on average, the gains in home appreciation have barely offset the declines in real (adjusted for inflation) household income. 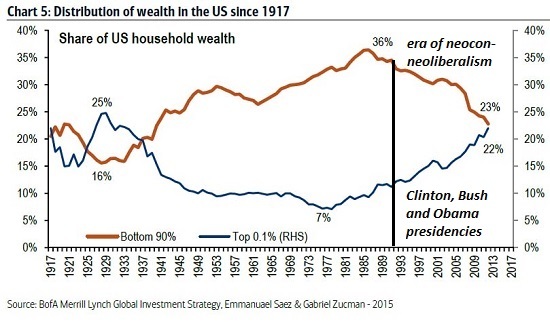 The Clinton, Bush and Obama presidencies shared one commonality: the wealth of the bottom 90% cratered in their presidencies while the wealth of the top .1% skyrocketed. 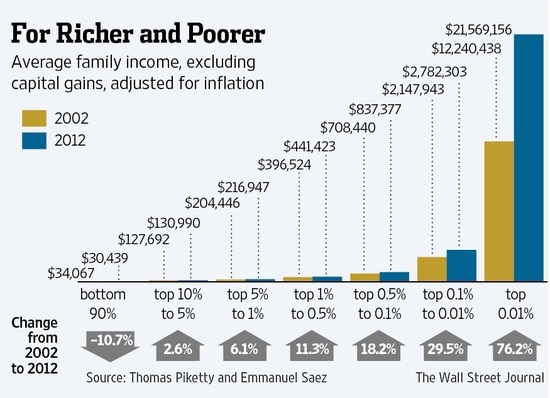 Central bank policies have generated a truly unprecedented "trickle-up" of wealth and income to the top .5%. Evidence supporting "trickle down" is nowhere to be found, at least in the real world. Thank you, Millie N. ($60), for your fantastically generous contribution to this site -- I am greatly honored by your steadfast support and readership. Thank you, Dugaboys ($50), for your supremely generous contribution to this site -- I am greatly honored by your support and readership. Those benefiting from these destructive "solutions" may think the system can go on forever, but it cannot go on when every "solution" becomes a self-reinforcing problem that amplifies all the other systemic problems. We are living in an interesting but by no means unique dynamic in which the solutions to problems such as slow growth and inequality have become the problems. This is a dynamic I have often discussed in various contexts. 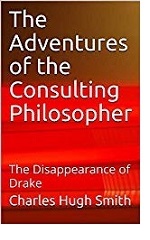 In essence, a solution that was optimized for an earlier era and situation is repeatedly applied to the present--but the present is unlike the past, and the old solution is no longer optimized to current conditions. The old solution isn't just a less-than-optimal solution; it actively makes the problem worse. As a result, the old solution becomes a new problem that only exacerbates the current difficulties. The status quo strategy is not to question the efficacy of the old solution--it is to apply the old solution in heavier and heavier doses, on the theory that if only we increase the dose, it will finally resolve the problem. Take borrowing from the future, i.e. debt, as a prime example of this dynamic.Back when credit was scarce and expensive, unleashing a tsunami of cheap, abundant credit supercharged growth by enabling millions of people who previously had limited access to credit to suddenly borrow and spend enormous sums of cash. This tsunami of new spending supercharged growth such that servicing the debt was easy, as incomes and wealth both expanded far beyond the cost of the new debt. Fast-forward to today, and adding 50% of the nation's GDP in new federal debt ($9 trillion) and trillions more in corporate and houshold debt in the past 8 years has yielded subpar growth--roughly 2% a year. This poor response to massive floods of credit, borrowing and spending has flummoxed conventional economists, who incorrectly assumed old solutions would always work as they had in the past. In a similar fashion, conventional economists expected fiscal stimulus to boost growth. 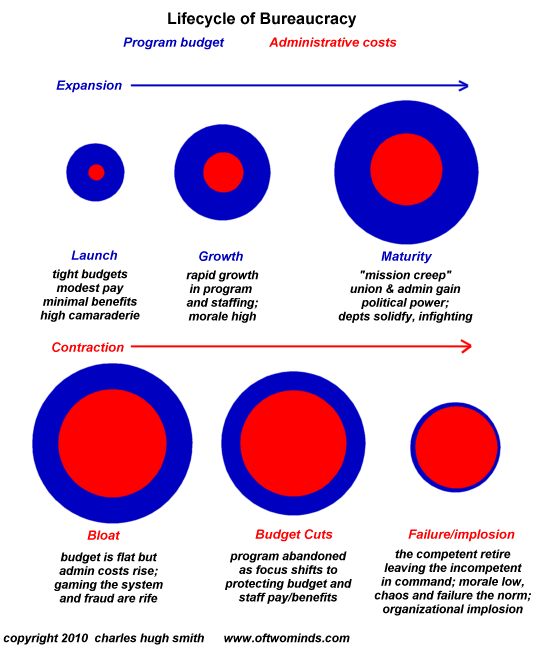 Fiscal stimulus--one-time tax refunds, infrastructure spending, tax cuts and various forms of "helicopter money"--central banks creating money out of thin air for the government to spend or distribute--have all failed to generate the self-sustaining virtuous cycle of boosting the output of the engines of income/wealth creation. As I noted in Fragmentation and the De-Optimization of Centralization (January 2, 2017), The 4th Industrial Revolution has de-optimized centralization. Centralized control, power and money are now the problem, not the solution. In the past, centralizing control of industries, credit and production increased the productivity of the whole economy. But that was then, and this is now. In the current era, centralization only breeds corruption, moral hazard, revolving doors between state agencies and private industry, opaque, rigged markets, rentier cartel parasitism and state-cartel crony capitalism, in which the central state regulates industries like Big Pharma, defense weaponry, higher education and so on to benefit entrenched interests, elites and cartels. Regulations have also slipped from being solutions to problems. Everyone weighing the costs and benefits agrees that building and zoning codes enacted at the turn of the 19th century and the beginning of the 20th century greatly reduced the health hazards posed by slums and unregulated industries. Everyone weighing the costs and benefits agrees that clean air and water regulations imposed in the early 1970s benefited the public and the nation, despite the higher costs for goods and services that industry passed down to the consumer. Technological improvements and efficiencies offset much or all of these costs by the 1980s, and by the 1990s, technological gains were increasing the income and wealth of almost every participant in the economy. Recently, these technological gains have become concentrated in the top 5% of wage-earners and the owners of the capital. There are several drivers for this, including proximity to cheap credit, tax evasion techniques available only to corporations and the wealthy, pay-to-play lobbying for tax breaks and regulatory barriers to competition, and so on--all the foul fruits of centralized power and the crony-capitalism it breeds. But technology is also exacerbating the trend to a winner-take-all or winners-take-most asymmetry between the most profitable and productive and "everyone else." Regulations have now become burdens rather than low-cost means of improving the commons shared by all. Advocates for "tiny houses" and similar solutions to homelessness run into buzz-saws of regulations that prohibit such construction and zoning, and advocates of innovations from urban farming to crypto-currencies find regulations (often serving the interests of political donors rather than the public) are stifling innovations and efficiencies that would benefit the many rather than the few. The regulatory agencies are prone to self-serving complexity that justified their budgets and power; as the regulations become more voluminous and arcane, "experts" in reading the runes and keeping up to date justify their big salaries and departmental budget. As I explain in my book Resistance, Revolution, Liberation: A Model for Positive Change, the state only knows how to expand; there is no mechanism, no institutional memory and no reward motivation to reduce the size of state power or revenues, or reduce the reach of the regulations and laws that empower the state to control virtually every aspect of life. There are many other "solutions" that no longer solve their intended target problem but have become burdensome problems in themselves. One need only look at healthcare, higher education and weaponry acquisition programs to find hundreds of examples of perverse incentives and unintended consequences that are the direct result of anti-competitive, intentionally opaque, centralized regulations that are implicitly designed to benefit the few (wealthy political donors, lobbyists and entrenched interests) at the expense of the many who are shut out of the regulatory game. Student loans are an excellent example of a "solution" becoming a problem itself, while the underlying problem--soaring costs for diminishing-return diplomas--rages on, enabled by the "solution": force student debt-serfs to borrow another trillion dollars to fund sclerotic, self-serving bloated bureaucracies. 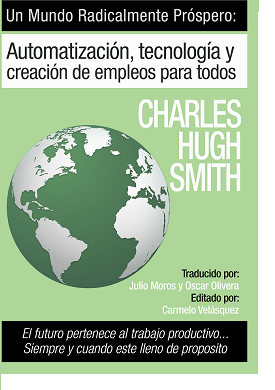 The Nearly Free University and the Emerging Economy: The Revolution in Higher Education. Borrowing and spending $9 trillion did little but indenture future taxpayers to pay for for our massive malinvestment in diminishing-returns dead-ends. 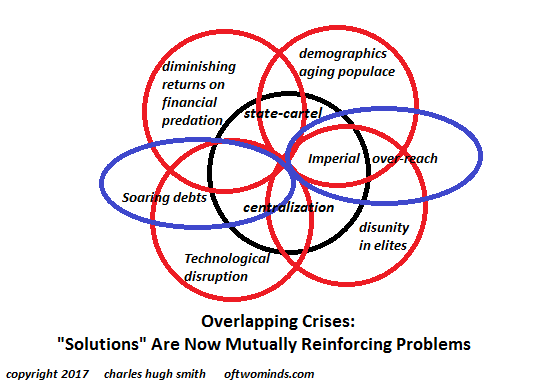 If we look at yesterday's chart of overlapping crises, we note each crisis began as a purported "solution." The "solutions" are: more debt (now a problem); more centralization (now a problem); financialization (now a problem); promising more benefits to everyone (now a problem), and so on. Real solutions are optimized for the 4th Industrial Revolution and the emerging economy, not the economy of 1946. These solutions are the opposite of all the institutional-state-cartel "solutions": decentralize power and control, transparency rather than self-serving obfuscation; empowerment of communities rather than centralized agencies and cartels, and embracing disruptive technologies--technologies that disrupt existing rentier skims, cartel rackets, regulatory barriers, etc. The cold truth is all these institutional-state-cartel "solutions" serve the few at the expense of the many. This is not a side-effect; it is the intended output of these "solutions." In other words, these "solutions" work great for the parasitic few at the top skimming all the wealth, power and income, at the expense of the exploited many and the stability of the system as a whole. Thank you, Jose S. ($200), for your beyond-outrageously generous contribution to this site -- I am greatly honored by your steadfast support and readership. Thank you, Kristi I. ($50), for your supremely generous contribution to this site -- I am greatly honored by your support and readership. No leader can reverse the dynamics of mutually reinforcing crises. Commentators seem split into three camps: those who see Trump as a manifestation of smouldering social/economic ills, those who see Trump and his supporters as the cause of those ills, and those who see Trump as both manifestation and cause of those ills. I think this misses the point, which is the overlapping crises unfolding in this decade-- diminishing returns on skyrocketing debts, the demographics of an aging populace, the erosion of the social contract and the profound disunity of political elites--will continue expanding and feeding on each other regardless of who is in power. Historical analysis seems to swing between the "Big Man/Woman" narrative that views individuals as the drivers of history, and the "Big Forces/it's all economics" narrative that sees individual leaders as secondary to the broad sweep of forces beyond the control of any individual or group. So while the mainstream views President Lincoln as the linchpin of the Civil War--his election triggered the southern secession--from the "Big Forces/it's all economics" view, Lincoln was no more than the match that lit a conflict that was made inevitable by forces larger than the 1860 election. The tension between these two narratives is valuable, as history cannot be entirely reduced to individual decisions or broad forces (weather, resource depletion, financial crisis, geopolitical upheaval, demographics, plague, etc.). The dynamic interplay between the two shapes history. Individuals do matter--but they cannot offset structural crises for long. Which brings us to Trump. The status quo is falling apart for profoundly structural reasons: promises made when growth was robust, debt was modest, energy was cheap and abundant and the work force was far more numerous than those dependent on the central state's "pay as you go" pension and welfare programs-- these promises made in yesteryear can no longer be kept, regardless of who's in power. We cannot get blood out of a turnip, and those who claim we can are only exacerbating the coming crises with their fantasies and denials. I've been addressing these slow-moving, inevitable crises for the past 10 years. 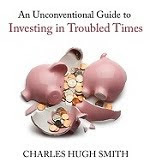 Despite the illusion of tepid "growth" and the maintenance of the status quo, beneath the surface everything is becoming much more fragile and increasingly brittle. Even Timothy Geithner concedes this in his recent Foreign Affairs article on how to deal with the next global financial crisis. 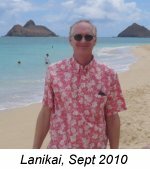 The central banks and states have expended all their ammunition-- lowering interest rates, creating money out of thin air to bolster systemic liquidity, buying bonds and other assets to prop up shaky markets, and borrowing immense sums to prop up government spending-- and there is little left for the next crisis. And this sober view--that some additional central bank trickery can save the system in the next financial crisis--assumes things that are unlikely to be true: what if energy is no longer cheap and abundant? What if global weather isn't conducive to grain surpluses? What if central banks buying stocks no longer props up the market? 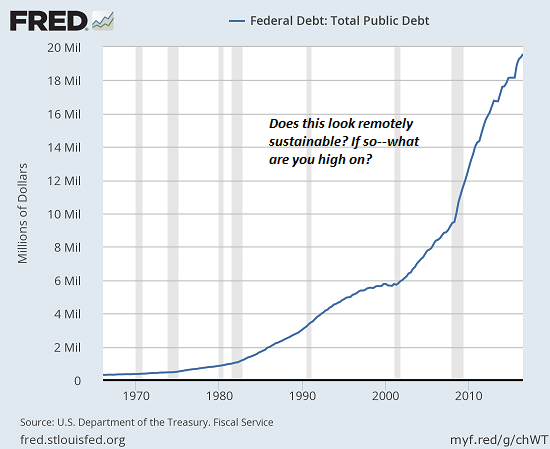 What if debt finally reaches levels that cannot be sustained? Could Hillary, or some other leader, forestall these deeply structural crises? The short answer is no. The only thing a leader can actually do is lower expectations so the erosion of promises that cannot be kept will be accepted as inevitable, and bolster hope while demanding sacrifices of all those who have benefited from the status quo. If we look back on great leaders who dealt with one crisis after another, we find they didn't actually make the crises disappear; they only managed them on the margins, and spoke to the need to make sacrifices for a better future. If we set aside the rose-colored glasses, we find that Franklin Roosevelt didn't actually "lead the nation out of Depression." 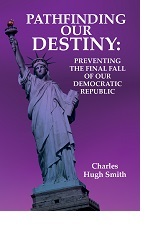 The nation was still deeply entrenched in the Depression in 1940, after 8 years of FDR's leadership. It took World War II and federal borrowing and spending on an unimaginable scale to extricate the U.S. from the grip of bad debt the powers that be refused to write off and the resulting stagnation. Which brings us again to Trump. Since no one can actually resolve these overlapping crises, a focus on the individual leader's actions is a distraction. Yes, an individual can manage the margins of crisis more or less effectively. But overlapping mutually reinforcing crises are not a war, with a victorious and a vanquished side. As Peter Turchin and other writers I have quoted and discussed for many years have detailed, these structural trends play out regardless of policy tweaks or grand pronouncements. Leaders who manage to ease the decline or temporarily reverse it are considered successes; those who exacerbate the decline are considered failures. 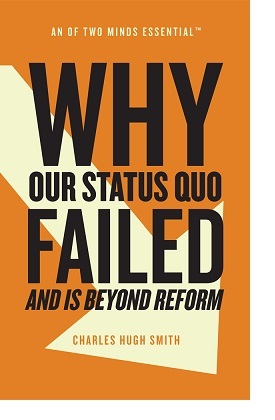 Why Our Status Quo Failed and Is Beyond Reform. No leader can reverse the dynamics of mutually reinforcing crises. No one can reverse the diminishing returns on financialization, debt, centralization, financial fakery, rentier state-cartel parasitism, or reverse the decline in paid work, the erosion of well-being and health and rising inequality. 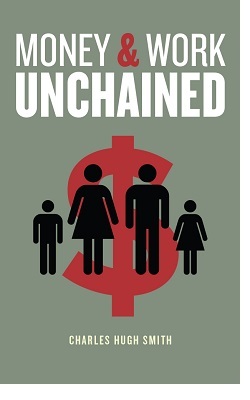 There is no way to actually forestall the reckoning as the forces of demographics, financial predation, Imperial over-reach, soaring debts, political disunity, technology disruption and the failings of state-cartel centralization grind up the status quo. This essay was drawn from Musings Report 5. The weekly Musings Reports are emailed exclusively to major donors and patrons ($5/month or $50 annually). 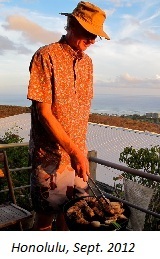 Thank you, Herb S. ($100), for your outrageously generous contribution to this site -- I am greatly honored by your steadfast support and readership. Thank you, Anthony B. ($50), for your superbly generous contribution to this site -- I am greatly honored by your steadfast support and readership.